Before you can work in Harmony via Harmony Server, you must be connected to the Harmony database. When you connect to the database, you cannot create new scenes directly from Harmony Premium. The available scenes will be the ones that were previously created using the Control Center module. Start Harmony —see Starting Harmony. In the Toon Boom Harmony window, select the Connect to Database option. In the User Name field, type in your Harmony username which is provided by your project lead or system administrator. 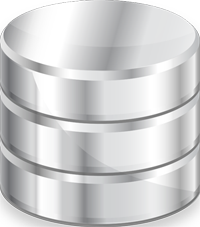 The Database Selector dialog box opens, displaying the environments available in Harmony database. 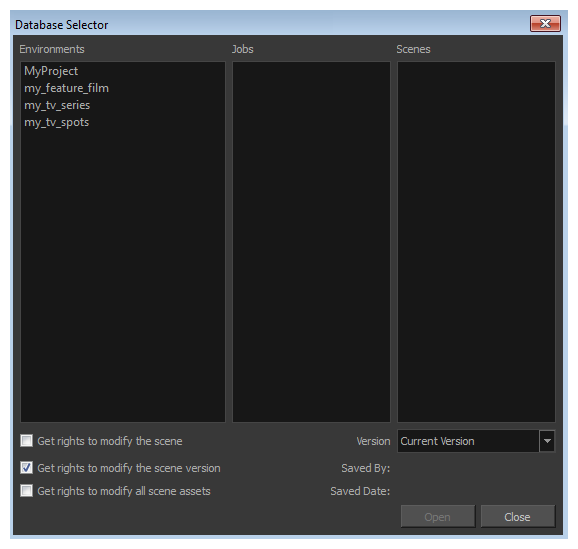 In the Environments column, select the scene's environment (project, movie). In the Jobs column, select the scene's job (episode, sequence). In the Scenes column, select the scene. A Harmony project can be locked at various levels. Its timing, drawings, version and palettes can be locked. Locking means that you have the rights to modify a scene or its assets. Other users cannot modify locked items. If someone tries to open a locked scene, it will be displayed as read-only. Scene or Version Lock Controls the Xsheet timing, layers, nodes but not the drawing, palettes, palette-lists or templates. Drawing Lock Only one user can edit and save a locked drawing. Palette Lock Only one user can edit and save a locked palette. Palette-list Lock Only one user can edit and save a locked palette-list. Library Folder lock Only one user can edit and save into that folder in the Library. Choose the version you want to open from the Version menu—see Saving Scenes. The Saved By and Saved Date fields display the user who last saved the selected scene and the date of the last save.